Quickly, Endgame is doing well, and I want to thank those of you who have read the book and given me feedback. I appreciate it. You can read the reviews at Amazon.com . And now to this week's letter. Back in 2002 (or so) I was writing about the curve in the road. In fact, that was the working title for Bull's Eye Investing as I was writing it. The concept is that one cannot see around the curve in the road, so it is very important to read the signs and have good maps as you go along. Bernanke (and Dudley) have been testifying that inflation is not an issue. But what signs and maps are they reading? 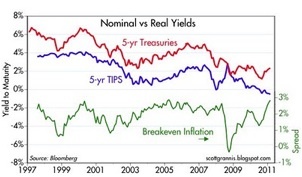 Bernanke specifically invokes inflation expectations as being most important, and he contends they are low. They both note that the "output gap" (more on it later) is still high and that wage inflation is unlikely in a period of high unemployment. But, as Greenspan recently said, "The problem is, none of these indicators will tell you when inflation is about to take hold." The Economic Cycle Research Institute wrote what I think is a very powerful editorial about the problem with Fed policy and inflation. I will quote some of the more important paragraphs, but you can read the piece in its entirety at http://www.businesscycle.com/news/press/2137/. "By using good cyclical indicators, you can - and we do - correctly forecast when inflation is about to take hold. "And it's precisely because the Fed - first under Mr. Greenspan and now under Mr. Bernanke - adamantly believes that inflation turning points can't be predicted, that the current U.S. recovery stands in danger of being snuffed out prematurely. "ECRI's future inflation gauges - which, unlike econometric models, monitor the evolution of self-feeding cycles in inflation - are designed to do just what Mr. Greenspan says can't be done. Specifically, they are more direct measures of underlying inflation pressures that signal the timing of upcoming inflation cycle turning points. In fact, they also anticipate inflation expectations. "... The Fed's ongoing reliance on inflation expectations, along with core inflation and the output gap - which Mr. Greenspan agrees don't work - strongly implies that they have no workable tools to decide when to pull back on stimulus. Their incoherence about policy timing is rooted in the belief expressed by Mr. Greenspan that forward-looking indicators of inflation can't tell when inflation is about to take hold. "Mr. Greenspan and his successor, Mr. Bernanke, are top-notch economists in an echo chamber where they are surrounded by other economists, who all tend to believe, deep down, that the best forward-looking information must be found in market prices. This is an economist's mistake. Even in the face of compelling evidence that markets aren't the best predictors of what's around the bend, it's really hard for economists to abandon their basic world-view. "This keeps the Fed chronically behind the curve. The "insurance" taken out by the Fed has been far from costless, especially in terms of the collateral damage from unintended consequences. Yet, damaging as it might have been in the past, the sheer size of the Fed's current balance sheet makes it more critical than ever to improve the timing of monetary policy shifts. 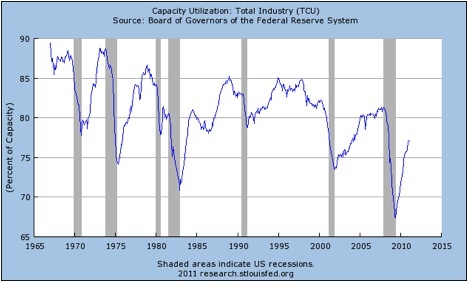 This "gap" coincides rather nicely with our old friend, Capacity Utilization. And while CU dropped to all-time lows during the last recession, it is up over 10% from the bottom, which is a much sharper recovery than during the previous recession. The Institute for Supply Management (ISM) numbers are still good, both manufacturing and service sectors, although beginning to show some signs of price increases. Yes, there is still an "output gap," but it is shrinking. If the chart below is any indication, that gap could be much smaller in a few years, assuming we do not experience a shock to the economy (more below). Employment is (finally) looking better. Slowly, we are seeing initial unemployment claims come down from the record highs of a few years ago. The Fed sees the total number of unemployed and says there is no pressure on wage inflation. I think it may be more subtle than that. Let's look at a graph from chapter 4 of Endgame: What it shows is that employment is very skewed, as is income. This was as of the end of 2009, but the principle is the same. The clear problem in the United States is this: If the highly skilled have 2.5 percent unemployment, how do you reduce that? You can't. That is probably the natural frictional rate of unemployment, that is, people naturally moving between jobs or geographies. Faster economic growth or more money supply won't bring down a 2.5 percent unemployment rate. There are clear trends developing. Those who have attained a higher level of education are not suffering to nearly the same extent as those at the lower end of the educational scale. Indeed, conditions for certain highly skilled workers could be described as tight. Furthermore, those who find themselves out of work are on average out of work longer now. The average time of unemployment has sharply increased from less than 20 weeks only two years ago to more than 30 weeks now -- a 50 percent increase. Those unemployed for shorter lengths of time now make up much less of the total than they used to. The majority of unemployed workers are instead primarily those in a chronic state of joblessness. Such people find it ever harder to get back into employment as their skills become rusty. This phenomenon is not confined to the United States. A similar pattern is developing in the United Kingdom and throughout the developed world. The stories of chronic unemployment in Portugal, where fewer than 30% have high school degrees, have been everywhere of late, as Portugal becomes the latest of the euro-area countries to need funding help. There are two main types of unemployment: structural and cyclical. In this downturn we have seen fewer hours worked and lower pay; these are cyclical. More ominous, though, has been the structural decline in the civilian participation rate. There has been an extreme rise in the number of long-term unemployed, who now make up almost 3.5 percent of the labor force. Because the U.S. economy needs to shift from consumption, real estate, and finance toward manufacturing, many of the unemployed will not return to their old jobs. "Only a long economic expansion" is the right answer. Another recession would obviously not be good for employment. As noted above, the Fed pays a great deal of attention to inflation expectations and says that today such expectations are low. Let's look at two charts (courtesy of Scott Grannis, http://scottgrannis.blogspot.com/2011/04/monetary-policy-update.html) which suggest that such a benign outlook may not be in our future. "Already, rental vacancy rates have dipped below the 10% mark, where they had been lodged for most of the past three years. 'The demand for rental housing has already started to increase,' said Peggy Alford, president of Rent.com... By 2012, she predicts the vacancy rate will hover at a mere 5%. And with fewer units on the market, prices will explode." Here's what to pay attention to. Notice that since 2002 (or thereabouts) rental costs have been flat, and down of late (inflation-adjusted). 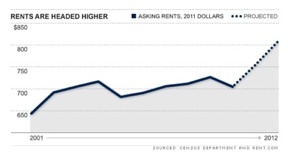 If Rent.com projections are anywhere close, we could see a rise in rents of 15% by the end of 2012. Let's remember that 23% of the CPI and 40% of core CPI is Owner Equivalent Rent. If they are right, that adds about 3% to total CPI and 6% to core CPI! Will the Fed be telling us to focus on core inflation in 12-18 months? And those prices will start to show up steadily. The latest data we have on inflation shows that the trend is clearly up. In particular, notice the rise in the last three months since the beginning of QE2. Inflation is running at over 5% on an annualized basis. Companies like Kimberly (diapers, etc. ), Colgate, P&G, and others all announced 5-7% price increases this week. These are companies that provide staples we all buy. Those prices matter. Even Wal-Mart will have to pass those increases on. To say that food and energy don't matter misses the point. These items have real economic impact. 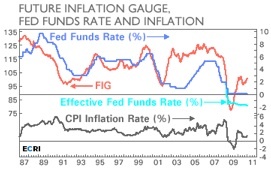 One last chart on inflation, and this goes back to the Future Inflation Gauge mentioned by ECRI. There is a clear correlation between the FIG and inflation, which suggests that we will soon see rising inflation. Everyone knows the Fed is going to finish this cycle of quantitative easing (QE2). But how does that translate into actual inflation? It's not showing up in the money supply as measured by M2. 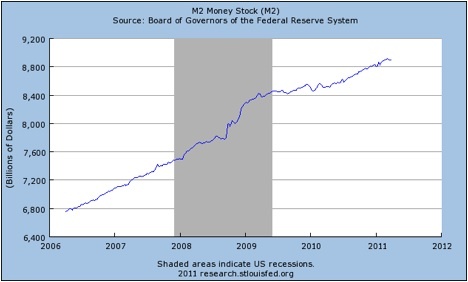 After a liquidity-induced jump during the recent crisis, M2 is growing roughly at the same rate as it has for years. 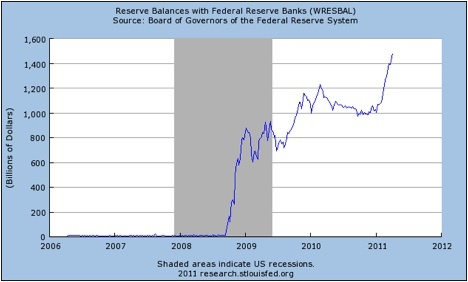 In fact, the excess money is showing up back at the Fed in the form of reserve balances with the various reserve banks. 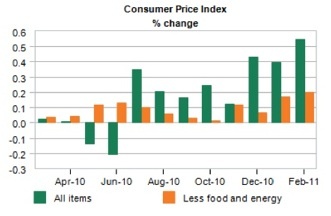 So how is inflation showing up in commodities, oil, and food? Let me posit a few thoughts, although I am open to readers enlightening me further. One, emerging markets are being forced to take on huge foreign reserves if they do not want to see their currencies rise. This means they are adopting the loose or easy monetary policy of the Fed, which means they are now being forced to deal with inflation. Stratfor reported today that Vietnam, for instance, has 14% inflation. China's is in that range, notwithstanding the "official" numbers. That means they will have to allow their currencies to rise, but it also means that food and energy, which are close to 50% of their consumer spending, are very impactful. It means rising wages and higher costs, which the CEO of Wal-Mart says are now being passed on. This easy-money policy means a lower dollar, which is another way of saying rising commodity costs, especially for oil. 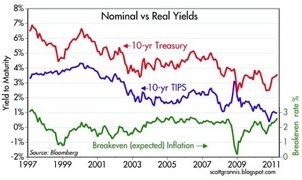 And most importantly, this policy is in fact building in inflation expectations, which is most worrisome. Right now there is no fundamental reason the economy should roll back into recession in the near future. There is no need for QE3, although I have written about the potential problems when we stop the current QE2. But that being said, the US economy should be growing at almost 5% in this part of the recovery cycle, not 2.5%. This is a very weak recovery by historical standards. What happens if there is an "exogenous" shock (something outside of the system)? What happens if there is a true sovereign debt banking crisis in Europe? That is in the realm of possibility, as I have discussed. So is another oil shock. That large weapons cache in Nigeria is worrisome. What would $150 oil do? If the Fed felt compelled to "provide liquidity" through a dose of QE3, I think the markets would rebel. The dollar would certainly fall, driving up prices more, along with interest rates, if the last round is any indication. I maintained at its outset that QE2 was bad policy, because it wasted a bullet that we might need one day. I worry about what happens if we continue to do that. Hopefully, we don't have that shock and will have a long and sustained recovery, the government will bring the deficit down, and employment will rise. One can hope. But hope is not a strategy. We are in a hole and we seem to want to keep digging, at both the Fed and the US government. And we are exporting our problems of bad management to the world. We have chosen deliberately to take the inflation road. We have not traveled that road for some time. The Fed may think they know what is around the curve and what to do if inflation comes back, but no two crises are the same. I worry about these things. If the Fed and the US government wanted a weaker dollar, the return of inflation, and the potential for yet another boom-bust, they could not have designed better policies than the ones they're pursuing. I head for Portland tomorrow for a speech on Monday, back early Tuesday, and then off to New York for meetings on Wednesday. There, Tiffani and I will attend a charity event as the guests of Dr. Mike Roizen, for the HealthCorps®' Fifth Annual Gala (the charity of his multi-bestselling co-author, Dr. Mehmet Oz). This year's even, called "Fresh from the Garden Gala," will raise funds to fight the child obesity and mental resilience crises and expand the organization's groundbreaking in-school health educational and mentoring program. I understand there may be a few tickets left. Join us! I will guest host on Bloomberg TV with Betty Liu from 9 to 10 on Thursday morning. I was on her show this week, and we had a lot of fun. You can watch at http://www.bloomberg.com/video/68351042/ . I then hop a plane back to Dallas to be with my friends at JGAM and treat their clients to a Texas BBQ at my home. Martin Barnes of BCA will also be there, and it is always good to be with him, as well as my partner Steve Blumenthal. And that starts a 13-day run of being home, which I am ready for! I will be in Philadelphia Tuesday May 24 to moderate a panel and listen to a serious line-up of speakers at the 29th Annual Monetary and Trade Conference, where the topics are "Is Housing Ready for a Rebound?" and "QE2, Housing and Foreclosures: Are they Related? "Philly Fed president Tom Hoenig, Chris Whalen, Michael Lewitt, Paul McCulley, William Poole, and Gretchen Morgensen will join us, among others. To find out more you can go to http://www.interdependence.org/Event-05-24-11.php. It is time to hit the send button. I started this letter intending to quote only a few lines from the poem by Robert Frost, but it is so short and so wonderfully done that I decided we could all use a little uplift. Enjoy your week. For as long as I can remember Johns been banging on the deflation drum. And I also recall he concluded that QE had ended with QE1. Now its all about QE and inflation.